How many Stage Managers does it take to do ‘Our Town’? Needless to say, we’re thrilled to have Irene Bedard on board for our 40th Season-opening production of Our Town. But this iconic play—and the role of the Stage Manager in particular—is bigger than any one person. How much bigger? At last count, one week before previews, Perseverance Theatre’s Our Town boasts not one Stage Manager, but five: Bedard (Inupiaq, Yupik, Métis Cree), the Anchorage-born actor famed as the voice of Disney’s Pocahontas and as Suzy Song in Smoke Signals, among many other screen and stage credits; plus Frank Henry Kaash Katasse (Tlingit), a Juneau actor and playwright well known to Perseverance audiences, most recently for William, Inc., and They Don’t Talk Back; and Miciana Alise Hutcherson (Tlingit), a rising talent also from Juneau, though she’s spent time away building her acting résumé in Los Angeles, Seattle, and Las Vegas. Katasse and Hutcherson, Bedard’s official understudy, will share Stage Manager duties when Bedard must bow out for brief but important engagements out of town. • Frank Katasse will perform as the Stage Manager on Oct. 5, 6 and 7 (opening weekend). 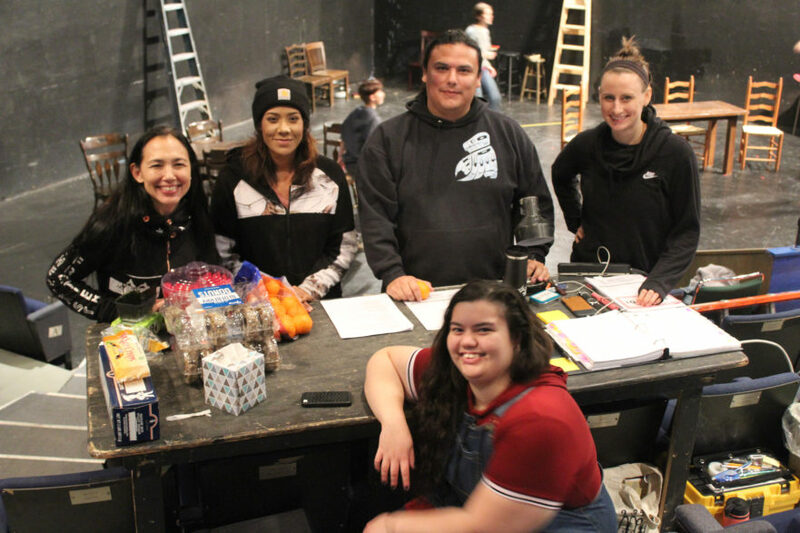 • Irene Bedard will perform as the Stage Manager on Oct. 2 and 4 (previews), Oct. 10-14, 17-21, 24-25, 31, and Nov. 1-3, as well as the entire run in Anchorage, Nov. 9-25. • Miciana Hutcherson will perform as the Stage Manager on Oct. 26, 27, and 28. Some Our Town patrons might wish to experience the show multiple times, seeing how the play changes depending on which Stage Manager is in charge. Super Subscribers (those purchasing the entire season) enjoy free repeat-viewing privileges, as often as they wish, space available. For others, Perseverance offers several Pay-What-You-Can performances (both previews, Oct. 2 and 4, and the 4 p.m. Oct. 7 and 7:30 p.m. Oct. 11 shows), as well as half-price Juneau Arts Night (7:30 p.m. Oct. 24), to make attending more than once more affordable. Do keep in mind that all casting is subject to change due to illness or other last-minute problems. Perseverance can promise that whenever you choose attend Our Town, you will see an unforgettable performance of a great American play. So who is this Stage Manager character, anyway? It’s easy to think of Our Town’s pansophical narrator as a stand-in for the playwright himself; Thornton Wilder did play the role many times, first as a two-week substitute for a worn-out Frank Craven in the original 1938 Broadway production. “All that memorization!” he wrote in a letter to his mother at the time. “The day before the opening I was in despair. I thought I’d disgrace everybody, but ‘opening night’ was all right. And it’s getting better every time.” Our own Stage Managers, who’ve had to divvy up rehearsal time three ways, might not wonder at Wilder’s struggles to master the part, though he wrote it himself. But there’s a larger, almost transcendent aspect to the Stage Manager’s presence. The character is rooted in the physical realities of the theatre, as any stage manager must be; and he’s certainly got both feet planted in Grover’s Corners. (“In our town, we like to know the facts about everybody,” the Stage Manager says—and he does.) The rest is up to every Stage Manager, and over the decades there have been thousands of them, all over the world, to discover and define. Has it caused any confusion in rehearsal, having so many Stage Managers and stage managers on deck? M.B. : Confusion? Not really. Excitement, depth, and tons of rehearsal snacks? Most definitely. For theatregoers who only know about stage managers from seeing Our Town: What is a stage manager, really? Why do you think Thornton Wilder made a stage manager the (arguable) hero of this play? M.B. : Well, on the real, the stage manager is the hero of every play. As it’s often said, the stage manager is totally responsible for totally everything. If there’s no stage manager, the show really can’t go on! Stage managers call rehearsals, coordinate backstage movement, track actor entrances and exits, ensure safety, run lights and sound, care for the actors and so much more. By the end of the show, it’s not uncommon for the stage manager to know actors’ lines and every cue by heart! They’re usually the first to arrive and the last to leave the theatre each night. I like to think of the stage manager as the ultimate “team mom”—you know, the rock-star person who’s at every practice and every game doing all they can to ensure that everyone has what they need to be the best actor, designer, director or crew member they can be. They know who likes the Capri Suns and who likes the orange slices. They know who needs pre-show naps and who needs pre-show lattes. They know that at least three players will forget to wash their costume, so they just wash all the costumes for everyone. They know who needs reminders and who needs hugs. And they do all of this so that we can put on the best show possible! Do all stage managers secretly dream of playing the Stage Manager—or are you content to stay behind the scenes? M.B. : While I do really love being on stage, there is no one better than Frank, Irene, and Miciana for this Stage Manager role. They are three incredibly talented actors (not to mention some of the kindest people you may ever meet) who each bring their own magic to the role. Even more so, it is important that Alaska Natives are the lead storytellers in this show, produced on this land and in this community.